THE FIRST OES KENNEL IN FINLAND WHICH HAVE GOT THE FINNISH KENNEL CLUB'S VUOLASVIRTA PLAQUE FOR SUCCESFUL BREEDING! THE SECOND AUSSIE KENNEL IN FINLAND WHICH HAVE GOT THE FINNISH KENNEL CLUB'S VUOLASVIRTA PLAQUE FOR SUCCESFUL BREEDING! SATU WAS HONOURED WITH THE FINNISH KENNEL CLUB'S GOLDEN MEDAL FOR HER ACCOMPLISHMENTS IN VARIOUS CYNOLOGICAL VENUES IN KENNEL WORLD AT THE FINNISH KENNEL CLUB'S ANNUAL MEETING IN 2005! About Us: We are Satu Tanner (on the right) and Taija Tanner (on the left). Mother and daughter. Taija grew up with dogs. She recognices the dogs from far distances and in their different developing ages, she really knows dogs and that is why she also gets the best out of each individual when showing. 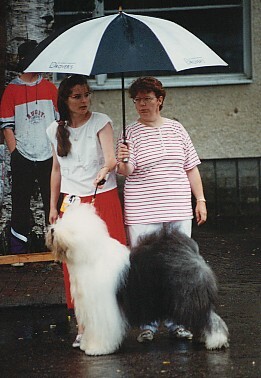 Taija decided some years ago that Satu no longer did know how to groom or show the dogs. So now Satu is a pare-of-free-hands if needed and she is very good in carrying things from car to the showground and back. That's the way life (must) goes on.